Tower Bridge – I had seen a picture in a Lonely Planet of a photo taken from the top of Tower Bridge, I had no idea you could go to the top! So back in April I went to see what it was like, you pay £8 to climb the bridge, be able to walk across the top, look over the city and view the exhibition at the top. If you are lucky you can combine the exhibition with watching the bridge be raised and lowered – These times are available in advance on their website. I like climbing to high vantage points in the city and knew this would provide a different take on the sky line to normal, when I think of London I think of being able to see Tower Bridge not looking from it. When I went it was quiet and I could stand for ages in one spot looking out, without someone else pushing in. I loved seeing the city from a high up place I wouldn’t have thought about otherwise. The exhibition about the history of bridges wasn’t of much interest to me except for the places I had been too. Needless to say I didn’t spend much time looking around the exhibition. I didn’t see the bridge lift this day, but have since gone back and witnessed it a few times, I would recommend timing your visit to get to see this – it really does stop you in your tracks while you watch it. Overall it wasn’t my favourite thing I have done in London but teamed with other things it adds to a great day of seeing the city. The Monument – It wasn’t till I saw this written in a book that I realized you could climb Monument, I know that sounds really silly now, but I just hadn’t given it a thought. 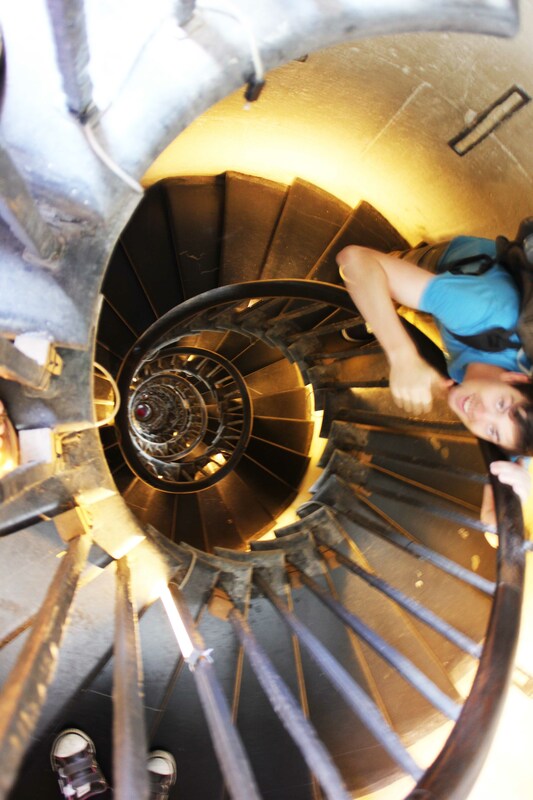 I paid £3 to get in and then had to climb a spiral staircase of 311 steps. This place doesn’t have a lift and you can see down the middle of the staircase the whole climb. It was a dizzy experience to say the least and I would only suggest the climb if you are healthy and have an average level of fitness – it’s a lot of stairs! Once at the top the views are something worth the climb, except for a mess protection you are out in the open and looking down on half of London. Despite the vast amount of buildings which have appeared since Monument opened you can still see a lot in all directions. It was thoroughly worth the 311 steps and £3, I would recommend this to anyone who feels like they can survive the 311 steps. The monument isn’t only a great place to climb to see London but it also has a meaning and importance. It was built shortly after the great fire of London and sits as many feet tall away from the starting point of the fire. Again something I did not know or think about before I climbed it. You can team these two attractions together and pay £9 instead of £11. Have you been to either attraction? What did you think? I just returned from London and stayed in an apartment near these two places – it was so convenient and I surprisingly liked the area. Check my blog for my latest post which is also a write up of the neighborhood!